Lily Novak takes up her stance. The senior hit a walk-off home run to secure a sweep for the Wildcats against Wisconsin. 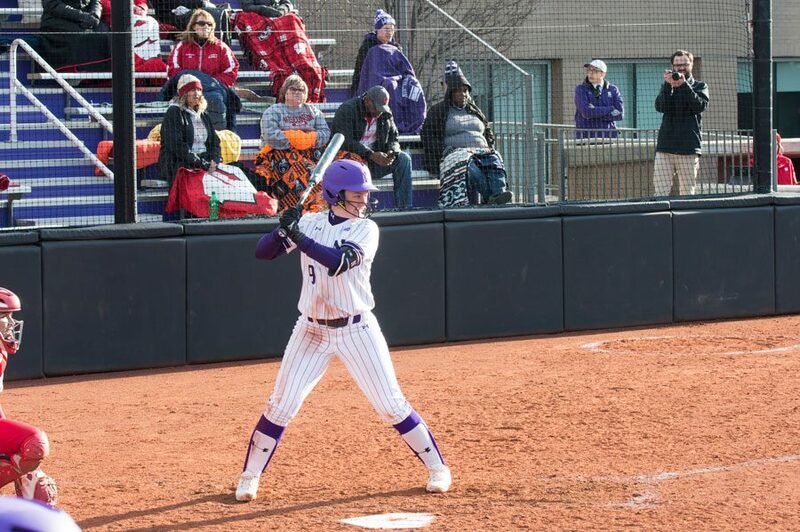 From small ball to slugfests to an extra-innings walk-off homer, Northwestern did it all this weekend in its sweep of Wisconsin, which continued the Wildcats’ 11- game win streak and guaranteed them sole possession of first place in the Big Ten. Entering the weekend, NU (33-7, 12-0 Big Ten) held first place in the conference alongside Michigan. But with the Wolverines’ loss to Ohio State on Saturday afternoon and the Cats’ triumph over the Badgers (30-8, 7-5), NU took the lead in the standings and maintained its perfect conference record. The Cats have now also won 16 of their last 17 games. NU opened the series at home Friday with a 4-1 victory against Wisconsin off only three hits. In a game of small ball, the Cats scored runs off walks, fielder’s choices, the Badgers’ errors and a few clutch singles. Saturday’s doubleheader featured more slugging, with a combined total of six home runs for the NU in its 8-5 and 5-4 wins, respectively. In the final game, senior Lily Novak hit a walk-off home run in the bottom of the 10th to give the series win to the Cats. The second game, however, didn’t begin as smoothly. The day started with a rocky outing from sophomore pitcher Kenna Wilkey, who allowed four hits and four runs in just 1.1 innings. Senior Kaley Winegarner came in relief and gave NU 3.1 innings, before junior Morgan Newport — typically an outfielder — earned the save. Drohan added that Winegarner and Newport’s experience against Wisconsin helped them in their pitching, and she praised their poise and offspeed pitches. Newport also contributed to the game offensively when she blasted a two-run home run in the bottom of the first. Sophomore Rachel Lewis smashed a three-run homer of her own in the fourth to give the Cats the lead, and moments later, senior Morgan Nelson gave NU its eighth run of the game with a solo shot to right. Throughout the series, Nelson faced many long at-bats, including one that lasted 14 pitches. Game 3 — which began around 30 minutes after the end of Game 2 — featured more big hits. Lewis popped another dinger, and so did freshman Maeve Nelson, who hit the ball so hard and so high that it landed on Welsh-Ryan Arena. But tied at four in the seventh, the game went to extra innings. Freshman Danielle Williams, who had pitched the full game on Friday, pitched all 10 innings in this final game with a pitch count of 160. Novak’s game-winning homer in the 10th finished the three-hour game and sealed the sweep and perfect conference record for the Cats. But Drohan said she doesn’t want to focus on the standings right now.